Sometimes it’s good to cheat! Pho is the type of food that makes you feel all warm and toasty and comfortable inside. Check out episode 8: Cheater’s Pho! Pour chicken broth into a pot, and add fish sauce, bay leaves ground ginger, coriander, and onion slices. Put the star-anise and cloves into a tea strainer or cheese cloth tied with twine and place it in the broth. Let it come to a boil, then simmer for at least 15 minutes. The longer it simmers, the more flavorful it will be. I like to simmer for about an hour. Put a bit of broccoli, cabbage, carrots, and chicken in the broth and let them cook until tender. 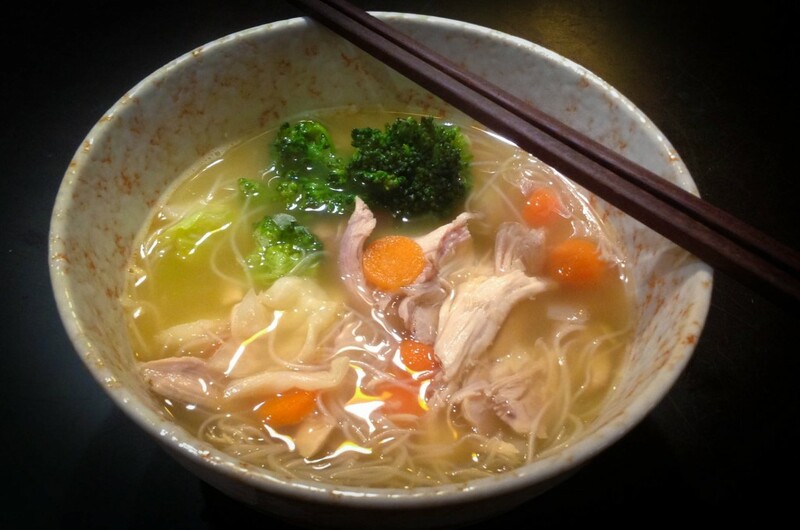 Put some softened rice or yam noodles into a bowl, and ladle the broth into the bowl. Pick out some veggies and chicken to place on top. You can add fresh basil, mung bean sprouts, and a squeeze of lime if you wish. A little bit of Sriracha sauce is a must for me! I would like to have your recipes in hard copy. Do you have that anywhere on your site? Also, giving us the nutritional information for your recipes would be marvelous! Thank you! What inspiration for children I too would like a hard copy of the Cheaters Pho.. Is it on the internet?? Thank you Debbie and Linda! I don’t know why the ingredients list didn’t show up on this page, but it is there now. Enjoy! This was a delightful and informative and very well done. I’m incredibly impressed by Amber. Excited to see what you do with your life. Were did you get your pot from and what kind is it Amber.